Whether you are getting ready to write 50,000 words in November for NaNoWriMo or you just want to make some headway on a large writing project, here are some tips and habits that will help you develop a system that will propel you to success. #1 – Start with a road map. If you are serious about getting your novel done, spend a little time writing a plot outline before you start writing your first draft. You don’t need to know all the little twists and turns, but a least know what your protagonist wants and why, and your final scene. Writing toward your final scene is easier than writing toward a limitless number of endings. You’ll save yourself a lot of time and words. #2 – Create a schedule. If you are participating in NaNoWriMo, print off a calendar for November. Block out your daily writing times. Hang the calendar by your writing space and give a copy to your family members and friends. This challenge is going to make you less available for social time. #3 – Tell your inner literary dragon to go away. You don’t need your inner critic when you are first-draft writing. And that is what NaNoWriMo is: a first-draft writing challenge, much like the 20,000 words in 7 days challenges I host on my Write Q&A Facebook page. Remember that a first draft is not a publishable piece of writing, not even for pros. It’s a lump of clay, nothing more, nothing less. So go easy on yourself and don’t start the challenge with the bar set at perfection. Perfection comes on the seventh, tenth, thirteenth revision. #4 – Look after yourself. Get some exercise. Eat well. Be rested and ready for the extra hours of writing. Know what healthy snacks and beverages you are going to use to fuel yourself while writing. Know how often you are going to take breaks. Gather your equipment. (I rarely write without a timer going.) Your imagination needs TLC to push on when the writing gets tough, and you need to counteract all those hours in the chair. #5 – Just start writing. There is no grand rule that says you can’t start writing today and keep going through the NaNoWriMo challenge month. If your genre calls for a longer piece, get 10,000 words or more down first, and then use the 50,000-word challenge to finish. In a nutshell, set up a writing system. Systems are way stronger than we are. 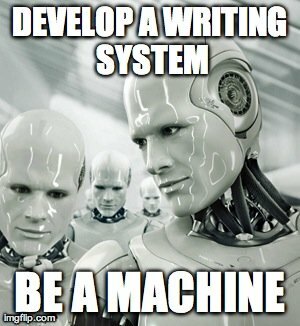 And then just write, write like a machine. There is also the nanowrimo young writers program. It’s for people under 17. It’s super fun. Oh no! Too bad one needs to be at at least thirteen to enter and I’m 12. You can still challenge yourself to write in November. For that, I won’t be waiting for November, I’ll start today!